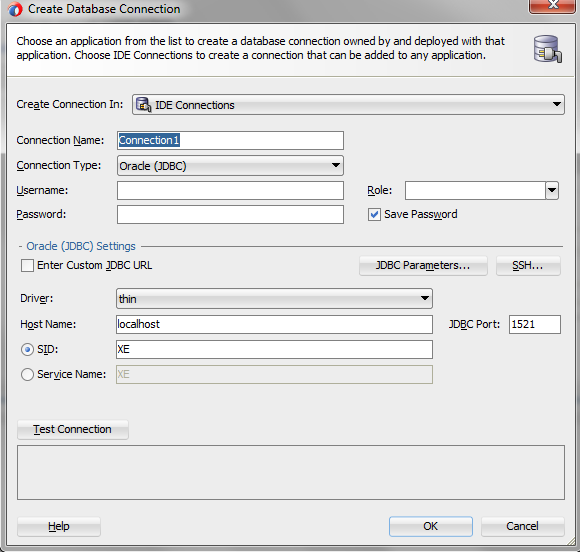 While doing development on J2EE and ADF very often it is needed to create Oracle Database Connection from Jdeveloper. Jdeveloper provides a wonderful easy window to create and manage multiple Database Connections. Since the environments have started to move to Cloud much often it is required to create Database Connection for the Oracle Database which is hosted on Oracle Database Cloud Service (DBCS). There was no way to create SSH Tunnel in Jdeveloper and one has to tunnel the traffic using Putty or SSH command and then use the localhost in jdeveloper database connection window to create successful connection to Database on Cloud. Jdeveloper 12.2.1 solved this problem by providing a very nice SSH Tunnel window in Database Connections Set up. This SSH Tunnel Configuration can be used to do configure the tunnel and use SSH Public key and user to create the connection. On clicking + sign for adding new connection, below window pops up. Give a name to the connection and provide username & password. Leave hostname as localhost and provide name of PDB in service name which you are connecting if using Oracle DB 12c. Now click on SSH. This is the new button in Jdev 12.2.1 which will open Tunnel Configuration. We are actually tunneling traffic to port 1521 thru SSH using this window. 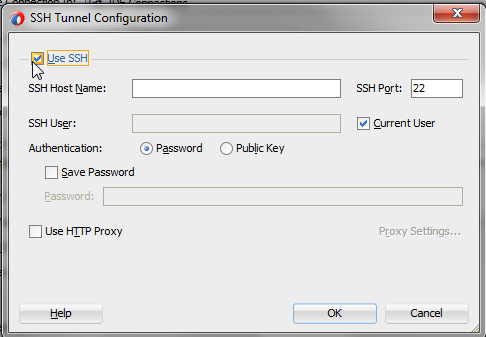 On the SSH Tunnel window, click on Use SSH. Provide the SSH Host name which is the IP Address of the VM on DBCS. 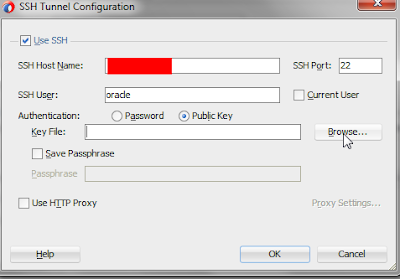 Uncheck - Current user and key in oracle as SSH User. Check Public Key for Authentication. Browse & select the private key file by clicking Browse button. Check on Save Passphrase if you have set Passphrase and provide passphrase for your private key if there is any. This will prevent jdev asking for passphrase again and again every time you connect to Database Instance. Click on Test Connection. It should be successful. Here you go. 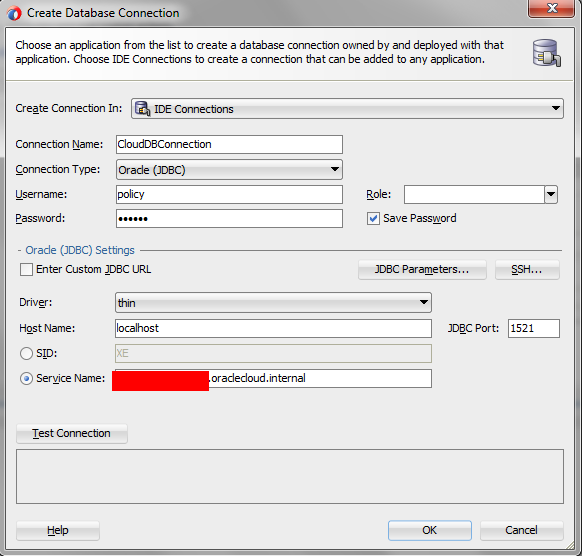 SSH Tunnel configuration window in Jdev 12.2.1 makes it very simple to create connection to Database Instance on Oracle Public Cloud without using any other tool or command to tunnel the connections. Thanks Abhishek. Glad you liked this post!! Thanks for the valuable information posted by you on oracle cloud.keep posting such articles. Have you ever stood up to Oracle Connection issue on Windows? Or on the other hand any sort of issue with respect to Oracle? In the event that yes, at that point picking a standout amongst other backings who appropriately take minds your issue by disposing of the issues. 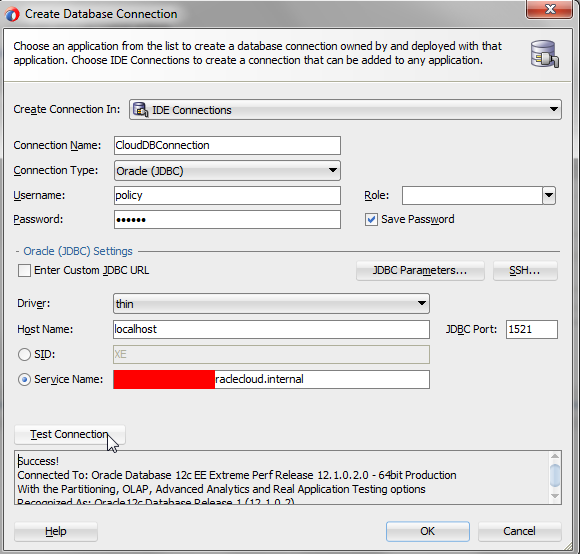 You will get this sort of help through Database Administration for Oracle and Online Oracle DB Support. At whatever point you need Oracle support you will quick through Oracle Database Solution. Our help is 100% honest to goodness and adaptable with the goal that you don't need to pick some other help. #Oracle #Applications comprise the applications ##software or business software of the Oracle Corporation. The term refers to the non-database and non-middleware parts. Oracle sells many functional modules which use the Oracle #RDBMS as a back-end, notably Oracle Financials, Oracle HRMS, Oracle #SCM, Oracle Projects, Oracle CRM and Oracle Procurement. Want to Learn Top Oracle Apps technical training, then you may visit the following link, and Training will be provided by top industry experts. Excellent blog. Thanks for your informative blog. Really good and informative posts.